If you are a true lover of Chocolate and Peanut Butter then this recipe is made for you! When it comes to eating candy, raise your hand if you tend to choose one with chocolate? I have a few in my family who go for the Reese’s, Kit Kats, Rolos, and Heath bars. Every time. Me and my hubby though, we prefer the chewy fruity…Swedish Fish, Starburst, and my personal favorite: Skittles. But, back to the recipe! This past holiday I made a couple batches of our favorite recipe: Buckeyes. If you haven’t had one, you really should try them. Remember I said I made several batches? Well, after dipping the umpteenth buckeye in chocolate, it made me wonder if they could be made into bars instead. I mean really, how easy would that be, right? After my first attempt, I knew I had the peanut butter layer nailed, but I had too thin a layer of chocolate on top (if you follow me on Instagram you would have seen this photo!) Instead of just adding more chocolate, I made a whole extra batch with a thicker layer of chocolate. They were perfect. I decided to call them “Buckeye Bars.” But, after my oldest took one, he said they tasted like a Reese’s. SCORE!!! You can call them Reese’s, or Buckeye Bars, but just promise you make a batch. 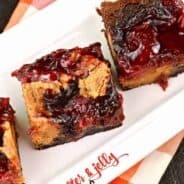 I’ve seen other recipes that use graham crackers crushed into the bar, and while I’m sure that is delicious, this recipe has no crumbs. It’s melt in your mouth peanut butter, sugar, and butter! I used Ghirardelli semi-sweet chocolate bars for the top layer. The chocolate melts so smooth, and tastes amazing. If you don’t want your chocolate to “crack” when cutting your bars, don’t refrigerate these bars. And cut them as soon as the chocolate sets (about 30 minutes room temperature). I originally cut them into squares, but in an attempt to portion control and make them smaller, I cut each square into a triangle. So fun! 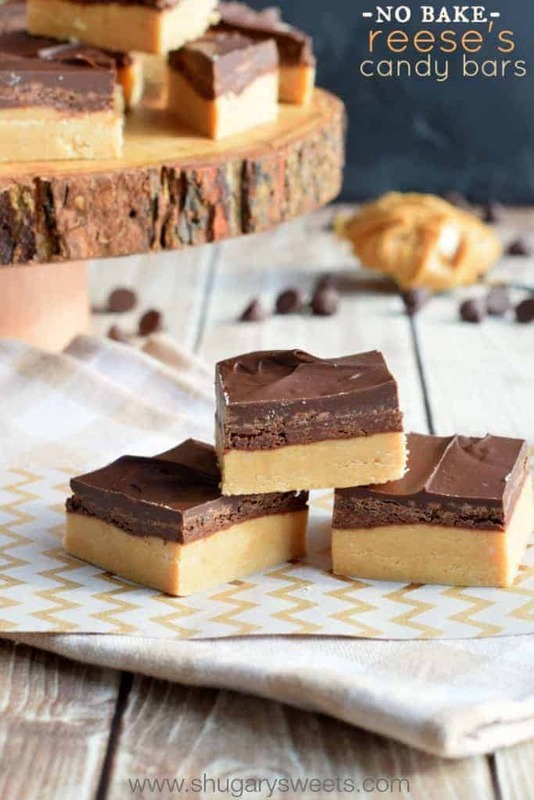 If you’re looking for more peanut butter treats…have you made these Buckeye Brownies yet? They are calling my name! 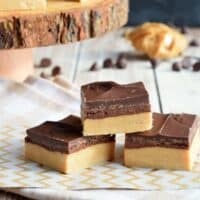 Buckeye Bars: no bake chocolate peanut butter candy that tastes like a Reese's peanut butter cup! Line a 13x9 inch baking sheet with foil. Set aside. In a large mixing bowl, beat 3/4 cup melted butter, powdered sugar, peanut butter and vanilla extract together. Mixture will come together into a “dough.” Using your hands, press into the bottom of the 13x9 dish. In a microwave bowl, combined chocolate bars (broken into pieces) with 1 tablespoon butter. Heat for 30 second intervals, stirring until chocolate is smooth (mine took about 1 1/2 minutes). Spread evenly over top of peanut butter layer. SCORE!! !, indeed, Aimee! Love, love, love me some chocolate and PB…especially if it tastes like Reese’s PB cups! Thank you for sharing. Pinning! Been making these for over 30 years from the Silver Palette cookbook. Yummy!! Nice to see them now and again!! Buckeyes in bar format, genius! So you don’t have to roll out all those buckeyes! Patience is not my virtue 🙂 Pinned of course! Chocolate and PB is right up there for me, and I love buckeyes. And in bar form too, oh yes! OMG. I’d eat the ENTIRE PAN. These would be dangerous. Love! My husband is the biggest PB fan I know. He would adore these bars! YUM! I love how these are so simple to make and no-bake! Doesn’t get much easier than that. I’ll have to wait to make them for a party or gathering, or I’ll eat the whole pan myself. This stuff is pure crack, Aimee! I mean, I know coffee is your thing, but I have a hard time not mainlining chocolate and PB on a daily basis. These are definitely my favorite! Perfect for Valentine’s Day!! Love love love. Reese’s are my favorite candy bar and these just got added to my must-do list! I grew up eating these and love everything about them! My candy craving change depending on the day. Sometimes its chocolate and other times it is the chewy candy. These buckeye bars look so much easier than having to roll all the balls! Yum! peanut butter and chocolate are two of my favorite things! Saw these in your email yesterday morning and loved them so much, I made them for the Super Bowl! I love buckeyes, and this was a great way to get the yummy without the tedious forming and dipping of the balls. I would like to suggest a few clarifications to the recipe though — since you recommend lining the pan with foil, could you say why in the instructions? I made mine in a 9×13 Pyrex, did not line it with foil, and had no issues getting the bars out. Also, for clarity you may want to edit the chocolate line in the ingredients — when I printed it out, it came out as “4 4 ounces ghirardelli semisweet chocolate bar” which momentarily threw me for a loop as 44 ounces is nearly 3 lbs of chocolate. I guessed you meant 4 x 4 oz for a total of 16 oz… which is what I did. My chocolate layer does not look as thick as yours does so I’m still wondering. They tasted yummy anyway! I line mine with foil, because then I can lift the foil out of the pan, place it on a cutting board and get nice even cuts. Oooh, yeah, i see what you mean about the 44oz. Nope you had that right, 4 (4oz) bars. My middle pieces were thicker with chocolate, so maybe those are the ones in the photo? Glad you enjoyed the recipe, thanks for coming back with your tips!! These would be a whole lotta dangerous in my house! I will need my fat pants. These look and sound delicious! What incredible looking buckeye bars. I just love how easy they are to make and how little ingredients they require whilst still being so sweetly delicious (i bet)! I love Reese’s and buckeyes so really I’m obsessed with these bars either way!! and SUCH a genius idea to make them bars to save yourself on time!! I have become quite the lazy baker when it comes to truffles and candies lately…bars all the way!!! 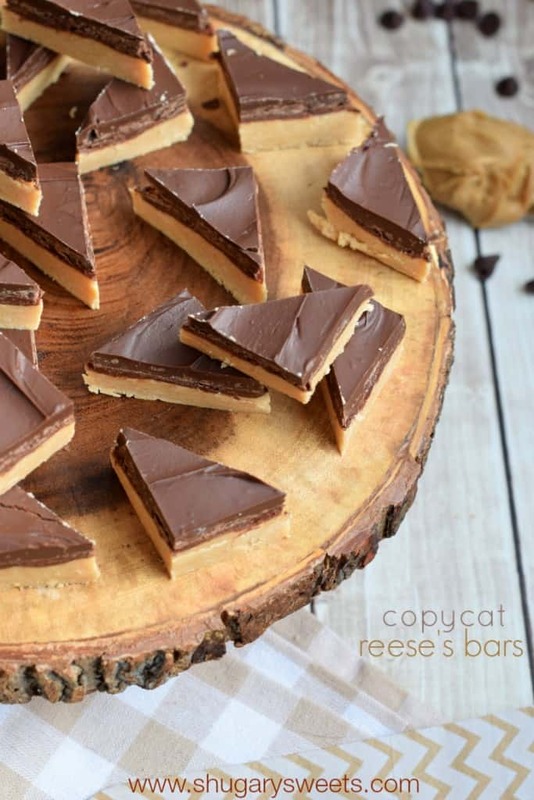 And these peanut butter chocolate wonders would totally not last the day in my house! Love that you remade them to have more chocolate!!! OMG! I’m already craving these! 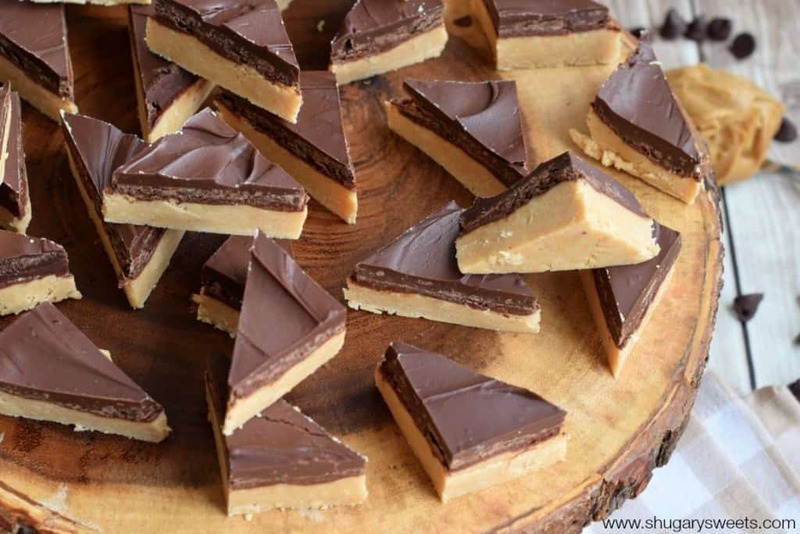 Peanutbutter and chocolate are my akillesheal.. Maybe I’ll make these on Satursday with a heavy red wine. Yum! Hi! Could these be made with peanuts instead of peanut butter? Because it’s kind of expensive here in Croatia. Regards! I was trying to find inspiration for dinner, but saw this instead and now this is all I want. Hey, peanut butter is good for you so this could count as dinner, right? I totally put a stamp of approval on this idea, haha!!! These do look and sound delicious, but aren’t they only a “Buckeye” because of their distinctive shape (shaped to look like the buckeye nut from the tree of the same name); without that shape it’s just another peanut butter cup wanna-be. I doubt that any Ohioan would call these a Buckeye, even if they are delicious. 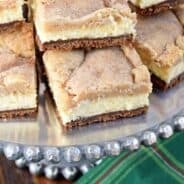 Having lived in Ohio for 8 years, I’m pretty sure none of my neighbors complained when I brought them a plate of these “buckeye bars.” After all, it’s just a name. And they taste EXACTLY like the traditional treat, only in a “bar form.” Making it easier for many people to enjoy! Could you use chocolate chips instead of the candy bars? If so how many cups would you use? I have the chocolate chips on hand……thanks! So easy and so good. Family loves them too. Have you found the same to be true with the bars–just asking as the PB isnt encased in chocoate as balls are?? thanks in advance for your response! They definitely seem to dry out faster. But if keep them stored in an airtight container (I would keep them UNCUT), they should be fine now until Christmas! Going to try this. Should the pan be chilled before covering with the chocolate? I normally would chill the balls before dipping. They don’t have to be. I’ve done it both ways. My peanut butter part seemed to soft,chocalate melted as soon as you touched it.would have liked it to be firm. Can you use dark chocolate chips instead of bars? I can’t eat anything dairy so wonder if the could be made without butter. Sorry I hit wrong key. My question was about making these without butter as I cannot have any daily products. We use earth balance. Or whatever. Hi seen your recipe on Facebook and in the video it looks like you used chocolate chips but it isn’t listed in the ingredients? Looks delicious- I made them & forgot to cut as directed – & put in frig to speed u setting ???? Guess now all cuts will crack ? You can try to let it come to room temp and then cut it? Does the recipe call for natural peanut butter ore regular peanut butter. Just want to be sure. Do you make 2 batches of chocolate to put on top? Chocolate and Peanut Butter, can it get any better? These look delicious, and can’t wait to make them! 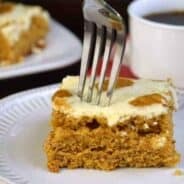 I love that this is a no bake recipe…it’s so easy! I am seriously drooling right now. There isn’t anything like sweet peanut butter and chocolate together. I’d definitely have to have a plan to share before making them though because I wouldn’t trust myself alone with these treats! I love buckeye bars!! They are always a hit with everyone. They are smooth & creamy & I love the peanut butter/chocolate combination! I always make these as gifts and everyone LOVES them!!! Can I use the 20 oz package of Almond Bark, like I use to dip the balls in?